What is MS PowerPoint Presentation? MS PowerPoint presentation is stands for Microsoft PowerPoint Presentation.Microsoft PowerPoint (or simply PowerPoint) is a presentation program, created by Robert Gaskins and Dennis Austin at a software company named Forethought. It was released on April 20, 1987, initially for Macintosh computers only. Microsoft acquired PowerPoint for $14 million three months after it appeared. This was the first Microsoft's Significant acquisition. PowerPoint became a component of the Microsoft Office suite, first offered in 1989 for Macintosh and in 1990 for Windows. The First beginning of PowerPoint is PowerPoint 4.0 (1994). From 1994, there are many latest updated version we get seen by which there are some few latest updated MS PowerPoint's are PowerPoint Mobile 2016 for Android / PowerPoint 2016 for Macintosh / PowerPoint Mobile 2016 / PowerPoint Mobile 2016 iOS / PowerPoint 2016 for Windows / PowerPoint 2016 for Windows Store. A search dialogue box will open, now write " MS PPT" or if PowerPoint Mobile 2016 for Android / PowerPoint 2016 for Macintosh / PowerPoint Mobile 2016 / PowerPoint Mobile 2016 iOS / PowerPoint 2016 for Windows / PowerPoint 2016 for Windows Store. Now click on PowerPoint Mobile 2016 for Android / PowerPoint 2016 for Macintosh / PowerPoint Mobile 2016 / PowerPoint Mobile 2016 iOS / PowerPoint 2016 for Windows / PowerPoint 2016 for Windows Store. Your MS PPT will appears on the computer screen. Select the PowerPoint Mobile 2016 for Android / PowerPoint 2016 for Macintosh / PowerPoint Mobile 2016 / PowerPoint Mobile 2016 iOS / PowerPoint 2016 for Windows / PowerPoint 2016 for Windows Store. 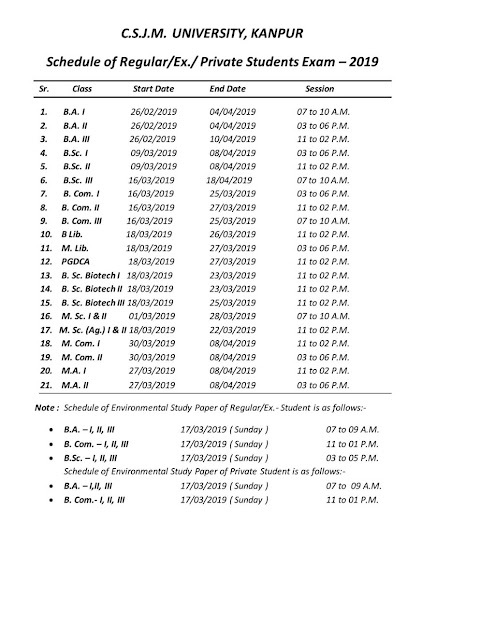 Your MS PPT will become open. PowerPoint was created by Robert Gaskins and Dennis Austin at a software startup in Silicon Valley named Forethought, Forethought had been founded in 1983 to create an integrated environment and applications for future personal computers that would provide a graphical user interface, but it had run into difficulties requiring a "result" and new plan. On July 5.1984 Forethought hired Robert Gaskins as its vice president of product development to create a new application that would be especially suited to the new graphical personal computers, such as Microsoft Windows and Apple Macintosh, Gaskins produced his initial description of PowerPoint about a month later (August 21, 1984) in the form of a 2-page document titled "Presentation Graphics for Overhead Projection. By October 1984 Gaskins had selected Dennis Austin to be the developer for PowerPoint. PowerPoint 1.0 for Macintosh shipped from manufacturing on April 20, 1987, and the first production run of 10,000 units was sold out. By early 1987, Microsoft was starting to plan a new application to create presentations, an activity led by Jeff Raikes, who was head of marketing for the Application Division. Microsoft assigned an internal group to write a specification and plan for a new presentation product. They comtemplated an aquisition to speed up development and in early 1987 Microsoft sent a letter of intent to acquire Dave Winer's product called MORE, and outlining program that could print its outlines as bullet charts. During this preparatory activity Raikes discovered that a program specifically to make overhead presentations was already being developed by Forethought, and that it was nearly completed. Raikes and others visited Forethought on February 6, 1987, for a confidential demonstration. 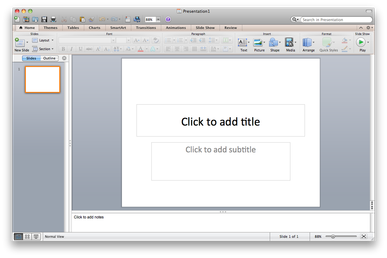 PowerPoint had been included in Microsoft Office from the beginning. PowerPoint 2.0 for Macintosh was part of the first Office bundle formMacintosh which was offered in mid-1989. When PowerPoint 2.0 for Windows appeared, a year later, it was part of a similar Office bundle for Windows, which was offered in late 1990. Both of these were bundling promotions, in which the independent applications were packaged together and offered for a lower total price. PowerPoint 3.0(1992) was again separately specified and developed and was prominently advertised and sold separately from Office. It was, as before, included in Microsoft Office 3.0, both for Windows and the corresponding version for Macintosh. A plan to integrate the applications themselves more tightly had been indicated as early as February 1991, toward the end of PowerPoint 3.0 development, in an internal memo by Bill Gates. The move from bundling separate products to integrated development began with PowerPoint 4.0, developed in 1993-1994 under new management from Redmond. 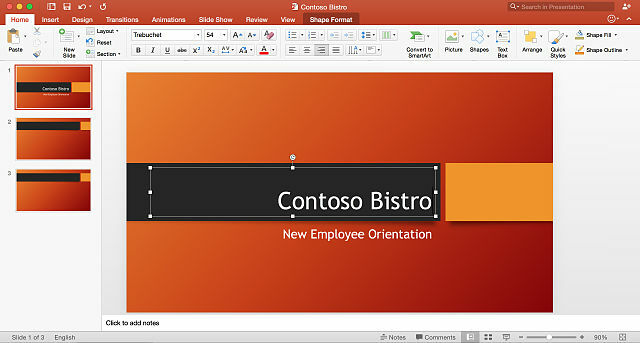 The PowerPoint group in Silicon Valley was reorganized from the independent "Graphics Business Unit" (GBU) to become the "Graphics Product Unit" (GPU) for Office, and PowerPoint 4.0 changed to adopted a converged user interface and other components shared with the other apps in Office. Since then major development of PowerPoint as part of Office has continued. New development techniques (shared across Office) for Power Point 2016 have made it possible to ship versions of PowerPoint 2016 for for Windows, Mac, iOS, Android, and web access nearly simultaneously, and to release new features on an almost monthly schedule. PowerPoint development is still carried out in Silicon Valley as of 2017. In 2010, Jeff Raikes, who had most recently been President of the Business Division of Microsoft (including responsibility for Office), observed: "of course, today we know that PowerPoint is often times the number two - or in some cases even the number one - most-used tool" among the application in Office. 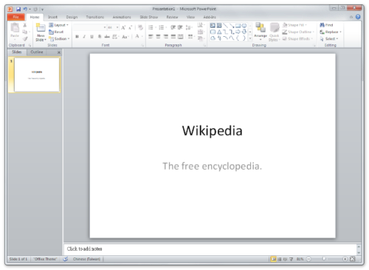 PowerPoint, more than most other personal computer applications, has been experienced as a powerful force producing change throughout all of society. In 2016 an analyst summed up : "the real mystery is, "how come almost every organisation in the world is using PowerPoint to communicate almost everything to almost everybody?" That's the real question. How come PowerPoint is everywhere? Generally, PowerPoint is originally targeted just for business presentations. It also uses for making presentation related to any educational topics which is generally used in schools, colleges and big seminars for presenting our own words in the graphic form or etc. PowerPoint use in business grew over its first five years (1987-1992) to sales of about 1 million copies annually, for worldwide market share of 63 percent. Over the following five years (1992-1997) PowerPoint sales accelerated, to a rate of about 4 million copies annually, for worldwide market share of 85 percent. The increase in business use has been attributed to "network effects," whereby additional users of PowerPoint in a company or an industry increased its salience and value to other users. Not everyone immediately approved of the greater uses of PowerPoint for presentations, even in business.Rich Gold, a scholar who studied corporate presentation use at Xerox PARC, could write in 1999: "Within today's corporation if you want to communicate and idea... you should use PowerPoint. Use of PowerPoint by the U.S. military services began slowly, because they were invested in mainframe computers, MS-DOS PCs, and specialized military- specification graphic output devices, all of which PowerPoint did not support. But because of the strong military tradition of presenting briefings, as soon as they acquired the computers needed to run it, PowerPoint became part of the U.S. military.